Fusing ancient and modern into one flawless façade is the Fairmont Peace Hotel, a landmark hotel in Shanghai for over 80 years. Consisting of two buildings, the North Building and the South Building, the hotel is separated by Nanjing Road. The two buildings combined to become the Fairmont Peace Hotel in 1959 after standing as two separate entities for over 40 years. Each hosted famous guests such as Charlie Chaplin, Bernard Shaw, and Ronald Reagan. The popular Jazz Bar featured veteran musicians who traveled the US and Asia to great critical acclaim. The Fairmont Peace Hotel closed in 2007 for a complete renovation and revitalization of the facilities in order to restore the historic hotel and meet the demand of the increasing number of guests. The re-opening in 2010 showed how this luxurious, Art Deco masterpiece had been brilliantly reinvented for the 21st century, with the old-fashioned glamour sparkling with a modern luster. Today, Fairmont Peace Hotel has over 270 guestrooms that feature luxurious furnishings and amenities. Guests can choose from six on-site dining establishments, including the world-famous Jazz Bar, which features six musicians with prominent international careers. The hotel also features a Willow Stream Spa, where guests can get phenomenal treatments and work out in the fitness center. There is also a lap pool, with a sauna and steam rooms available. For business meetings or celebrations, there is almost 20,000 square feet of space available for meetings, groups, and weddings, with several packages available for each. Cultural travelers will want to check out the Peace Museum, the on-site museum where guests can follow the fascinating history of the hotel from its origins as the Cathay Hotel to its current status as the legendary Fairmont Peace Hotel, shown through hotel memorabilia and other collected items. Situated at the famous Bund promenade and the unrivaled shopping area on Nanjing Road, the Fairmont Peace Hotel is the perfect place to explore Shanghai’s spectacular scenery and vibrant lifestyle. The city is home to the world’s second-highest observation deck in Shanghai Tower, a huge collection of ancient Chinese artifacts in the Shanghai Museum, and the busiest shopping center in the world on Nanjing Road. Guests can visit Old Town Shanghai for historic buildings and landmarks, take several classic tours along the river, the Bund, and throughout Shanghai. 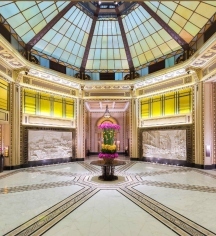 Fairmont Peace Hotel, a member of Historic Hotels Worldwide since 2018, dates back to 1929. Noël Coward typed the final draft of his play, Private Lives, a comedy of manners in three acts, at the hotel (known then as the Cathay Hotel). Age Requirements: Guests under 18 years old must be accompanied by a legal guardian. Cancellation Policy: Cancellations must be made 24 hours prior to arrival date. Early Check-In/Late Check-Out: Early check-in is subject to hotel availability; Late check-out before 6:00 p.m. will be charged a half-day room fee. Extra Person Fees: ¥350 + 15% service charge. Hotel/Resort Fees & Taxes: 15% service charge. Occupancy Restrictions: Two adults and one child per room. Payment: Major forms of payment are accepted. Payment is required at time of booking. Visa, MasterCard, Amex, and Discover are accepted. Rollaways: ¥350 + 15% service charge. 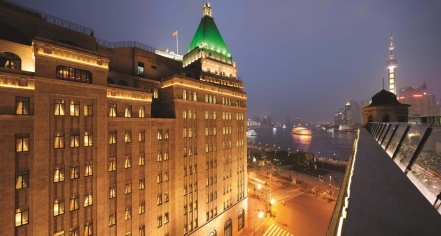 Fusing ancient and modern into one flawless façade is the Fairmont Peace Hotel, a landmark hotel in Shanghai for over 80 years. Consisting of two buildings, the North Building and the South Building, the hotel is separated by Nanjing Road. Learn more about the History of Fairmont Peace Hotel .